Rändi Fay is a recent addition to the singing and songwriting scene in Wisconsin, and is quickly carving out a reputation for defining "New Standards" with her capable blending of jazz, blues and pop. She refers to her genre as "lyrical jazz," rhythmic, melodic and memorable, and writes alone or with co-writer Mick Maloney, while fellow band members play a significant creative and technical role in the arrangements. In addition to fronting her band “Limited Edition,” Rändi’s versatile style has placed her in demand as a feature vocalist in a wide range of ensemble opportunities including the Big Band Reunion, Daddy D Productions, the Allouez Village Band, the Dudley Birder Chorale and the Wisconsin Choral Artists. She has recorded and produced three CD's since 2010: "Close to My Heart, Love Songs and Lullabies," contains enchanting songs with Rändi's resonant voice set in rich yet simple instrumentation to soothe souls of all ages. "Noël" is an insightful collection of holiday songs that embodies the wide range of emotions the season invokes, from magic to mystery, sung with Rändi's trademark sincerity. The third is a much-requested collection of jazz numbers. Smoky, sultry and sentimental, Rändi's warm vocals radiate with nostalgia in "That Old Black Magic," while at the same time offering fresh versions of treasured standards. She and fellow band members are recording a CD of all original music that is scheduled to be released in the spring of 2014. Jazz and Blues band Limited Edition: Greg Pagel-keys, Bob Balsley-guitar, Mick Maloney-bass, Kevin Crocker-percussion. Rosemary Clooney, Jo Stafford, Nina Simone, Peggy Lee, Sarah Vaughan, Joni Mitchell, Alison Krauss, Norah Jones, Eva Cassidy, Carole King, Stevie Nicks, Linda Ronstadt, Diana Krall. 2010 : "Close to My Heart; Lullabies and Lovesongs" -enchanting songs with Rändi's resonant voice set in rich yet simple instrumentation to soothe souls of all ages. 2011: "Noël" -an insightful collection of holiday songs that embodies our varied experiences of the season, from magic to mystery, sung with Rändi's trademark sincerity. 2012: "That Old Black Magic" -smoky, sultry and sentimental, Rändi's warm vocals radiate with nostalgia- jazz standards. Upon entering one of the most contemporary and modern style cafés in the Green Bay area, the Black Boot offered a very alleviate atmosphere for those attending on this night. One of the owners made it known that having the famed local Green Bay singer, Randi Fay, at the establishment tonight was a major music event for them and quite the privilege for the attending audience. Having toured in a wide range around the area this summer already, her experienced voice immediately grabbed the attention of the audience. 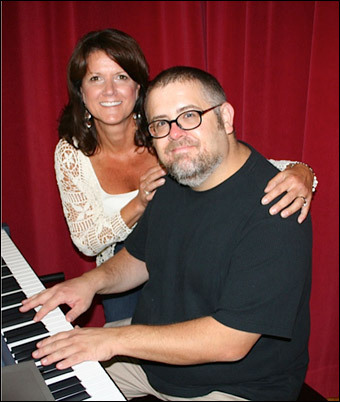 Accompanied by pianist Greg Pagel, the duo captivated the audience with their soft jazz/blues covers and original compositions. Covering songs from Billy Joel to Joni Mitchell, she delivered an off the charts performance. When evaluating her three albums that she had on display for the audience, I noticed titles of some songs in multiple different languages. Her bilingual singing ability was tremendously impressive and was a quality that really proved her vocal talent. In addition to the superb piano work to which she sang with, Randi also made use of egg shakers to help give some of their cover songs a very unique twist of their own. This combination provided enthralling entertainment for Black Boot. Many of the audience members enjoyed her music over a small meal or drink, which seemed the proper manner. Not in any way excluding the performance taking place, but using the performance almost as another condiment to their meal or to help garnish their drink. Her voice showed its ability to relax the audience by slowly quieting the audience and securing a peaceful ambience the deeper into her set she went. By performing at the Black Boot, she was without a doubt nailing her target audience. I would highly recommend any type of singer who would enjoy watching an experienced vocalist perform to seek out another of Randi’s performances when she is in the area. You can find all of Randi’s information including her music and tour dates here on her website http://randifay.com/index/.